Twenty years after a massive, record-breaking oil spill near the northwest Russian town of Usinsk, there has been a fire at an oil storage facility in the same region (pictured below). These safety breaches aren’t isolated incidents. In the vicinity of Usinsk, near the large oil refinery and storage site, oil slowly seeps into the ground and leaches into the water. The cause is old and corroded oil pipelines in the Komi province – and across Russia. The result is an estimated 30 million barrels of spilt oil each year worse than Nigeria and around six times the amount lost in Deepwater Horizon, according to a report from Greenpeace Russia. Around 10% of the spilt oil reaches the ocean through Russia’s polluted rivers. The leaks were caused by ageing infrustructure permitted by weak regulation – according to the study. It found pipes were often used for double their safe lifespan and fines for breaches of environmental regulations are normally insubstantial. Even where fines were issued, they were often not paid. In 2013 Lukoil was fined 615 million rubles (about EUR 14 million) for environmental violations – the biggest fine ever for oil spills in Russia – but the fine was dropped on appeal. In the Usinsk region the researchers found swamps full of oil, leaks into the River Kolva and pollution of a nearby lake. All were identifiable in recent satellite images of the oil plant (see below), which is owned by Lukoil, Russia’s second-largest oil company. © Greenpeace Investigations/Skybox Imaging, Inc. You can see more satellite images here. But the leaks spread beyond Usinsk. The report found worse spills in Russia’s largest oil producing region – Khanty-Mansiysk as well as the the Yamal-Nenets Autonomous Districts and Tomsk region. The spills can travel along rivers into the Arctic ocean. In 1994 a major Usinsk spill did move from the Kolva and then into the Pechora river, a major waterway in northwest Russia and from there into the ocean. In fact 3.5 million barrels of oil a year flow into oceans, according to the report. Around 1% of Russia’s annual oil production, of 500 million tons, is spilt with around 10,000 pipeline leaks each year – according to official figures. 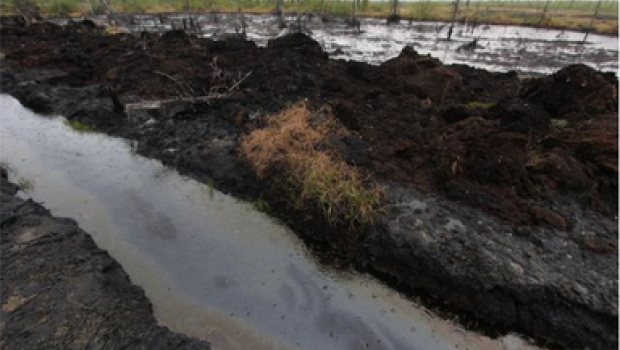 In 2011, state-owned Rosneft, Russia’s oil giant, reported over 6,800 spills, and Lukoil 3,700. The spills appear to be taking place despite increased investment from western firms in Russia, designed to upgrade the country’s flagging oil and gas infrastructure. Multinationals involved in the exploitation of fossil fuels in Russia, include Shell, Exxon and BP, which have joint ventures with the Russian firms. However, in the past decade there have not been any reductions in the number of spills. BP, which owns a 19.75% share of Rosneft, had a partnership with Russian Tyumen Oil Company, called TNK-BP. The joint venture reported 880 oil spills in 2010. The firm was then bought by Rosneft in a $55bn deal earlier this year. Shell has been involved in developing the Salym oilfields in Western Siberia, which Gazprom touted as ‘one of the largest investment projects with foreign participation in the Russian oil industry’ in 2012, however Russia revoked the environmental seal of approval from the project for its threats to marine wildlife and local communities. French firm Total with Russian Novatek, and Norwegian state-owned energy giant Statoil, have had numerous pipeline leaks in Nenets Autonomous Region. The environmental problems come with several Arctic drilling projects planned in joint ventures between Russian and Western oil companies. Exxon Mobil and Rosneft started exploratory drilling in the Kara Sea with the launch of the Universitetskaya-1 rig over the weekend (9 August) – despite US sanctions on the Russian company over the crisis in Ukraine. The drilling is located in a Russian Arctic National Park and appears to violate environmental rules. Meanwhile in the Komi region of the Northwestern Federal District of Russia, where Usinsk is based, hundreds of local people have been protesting against environmental pollution they claim is ruining their drinking water and killing their farm animals. The region is located in a belt of taiga – a zone of coniferous forests – and inhabited by the indigenous Komi people, which are mainly fishermen, hunters and reindeer herders. This Spring people made the unheard of and unprecedented step to vote at a public hearing that fossil fuel industries should stop in one of the affected areas, Izhma district. This challenged Lukoil’s right to operate in the area. They also clean up the leaks, which occur regularly, themselves. Greenpeace has today started an oil spill cleanup and search for leaks in the Usinsk District and Nenets region.